I’ve been traveling back and forth on the BC Ferries for over 30 years now and I have loved and appreciated every single ride. I never tire of the peace and joy of traveling across the water, through the passes and ever changing shore lines. I can tell there a lot of riders that feel ho-hum about this mode of transportation but there are always the ones you can see that are really in enjoyment of this transition. I read, sketch and/or knit but I also treasure the time people watch or people listen or to just sit a look out. I have been photographing on these ferry rides over the years. The journey on the ferry seems to be constantly full of amazing images but of course the ones I just missed are the images I will probably remember the most … lost jewels. 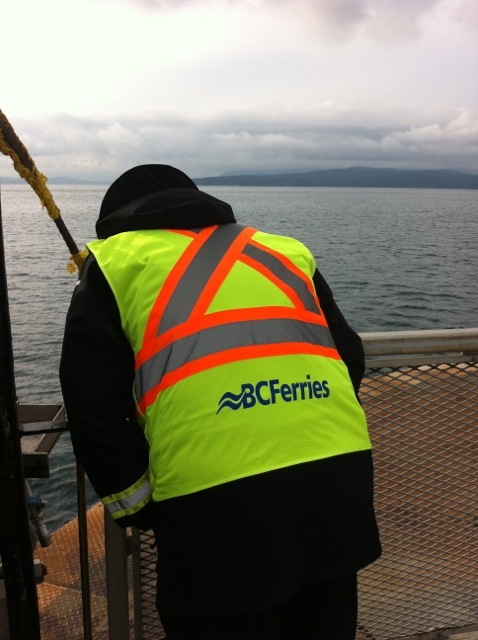 This entry was posted in blog and tagged BC Ferries, boats, documentation, Ferry, photography by nancywalker. Bookmark the permalink.